This video above is a dramatic reading of the Prologue of John. 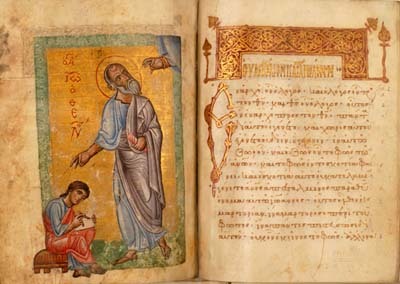 This gospel is also seen as a hymn which can be read about on another page. The Prologue of John’s Gospel may only be eight lines long, but it connects many parts of the Bible together. John starts by stating, “in the beginning” (John 1:1). This language relates directly back to the start of Genesis, “in the beginning when God created” (Genesis 1:1). Since John started in this particular way, it brings in [RF2] pieces of creation. In John’s Gospels, the author uses particular wording and capitalization that also foreshadows other texts. He uses “Word” to refer to it as God’s voice (John 1:1). This is capitalized in order to show that God has immense power and his word is the one to follow. This leads into the next sentence of the prologue where it states, “and the Word was with God, and the Word was God” (John 1:1). This repetitiveness gives double meaning to the sentence. It says that the word was with God, meaning he has it as a part of his being, but also that the word was God and if you live by his word you are living in the image of God. Another similarity between Genesis and John is when it states in John, “All things came into being through him” (John 1:3). This shows how God is the creator, and everything had to be made through him. This alludes to Genesis when it says, “’Let us make humankind in our image” (Genesis 1:26). Since everything came to be because of God then he made everything to mirror his love for the people and what he wanted society to be like. This also correlates to John when it states, “What has come into being in him was life” (John 1:3-4). He knew that everything he made would be like himself because it also stated, “God saw everything that he made, and indeed, it was very good” in Genesis because everything he made was in good nature to make humankind superior (Genesis 1:31). When it states “and the life was the light of all people” This means that the life God gave to them is meaningful because God made it (John 1:4). The idea of ‘light’ is seen in both John’s Gospel and Genesis. The light, meaning God’s goodness and virtue, “shines into the darkness, and the darkness did not overcome it” (John 1:5). The darkness, meaning evil spirit, was not able to combat the virtuous light of God because he made all people with the ability to have light. In the creation story of Genesis, it states, “’Let there be light’ and there was light” (Genesis 1:3). God has the ability to make anything the way he wants. The role of creation in the Prologue of John parallels that of Genesis closely while also contrasting symbols and themes. The element of creation in both scriptures focus in on light and darkness, human creation, and the imagery of the garden. Writer Mary L. Coloe offers an interesting exegesis on the grounds that the creation in the gospel of John is centered on the garden. Coloe offers the explanation as imagining that the reader has been given a canvas to paint the picture of John’s interpretation of creation. She begins to describe the picture people might paint with the canvas and what might be included in the painting. The creation theme is found at the beginning of the gospel of John, which begins with quoting Genesis. John’s prologue closely follows that of Genesis continuing to portray the battle between light and darkness that is a parallel in Genesis. The creation of light and darkness is presented in John’s gospel as a conflict in which the darkness is unable to overcome the strength of the light. The next component of creation that is mentioned in John’s gospel is the creation of humans. There is a contrast from the creation of human beings in Genesis in comparison with the human creation in John. Genesis writes the creation of humans to be “male and female in the image of God” (Gen 1:27) while John writes of human creation as those who believe can become children of God. The creation of human beings involves a process of believing in God and receiving him, that is when you can become a child of God according to the gospel of John. The second contrast that follows is creation on the seventh day. According to the gospel of John the Sabbath was the day of rest for God when he had finished creating. However according to the Gospel of John the creation did not stop on the seventh-day because further in the gospel he is still creating, “My father is still working and so am I” (5:17). The interpretation of creation in John’s gospel is continuous as opposed to Genesis where there is a day that it all comes to a stop and is finished. According to John, creation is brought to an end when Jesus dies at the cross and the breath of the Spirit is released. Coloe argues that there is no equivalent to the seventh day that Genesis mentions compared to John, a very important distinction between the two.